Panic Room’s Jonathan Edwards talks about the band’s new album ‘Incarnate’. 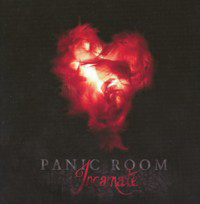 Panic Room came about in 2005 or so when keyboard player Jonathan Edwards had a few ideas for songs which he asked singer Anne-Marie Helder to breathe some life into. 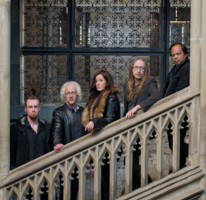 With guitarist Paul Davies and drummer Gavin John Griffiths joining up – the four knowing each other from Karnataka – and the addition of bassist Alun Vaughan the band was born. Since then, the release of ‘Visionary Position’ (2008), ‘Satellite’ (2010) and ‘Skin’ (2012) have charted Panic Room’s development from their early roots into a band of both majesty and magnificence. Picking up on “the musicians involved”, as ‘Skin’ introduced new bassist Yatim Halimi, so ‘Incarnate’ is the first album to feature guitarist Adam O’Sullivan, who not only locks into the band’s sound on record but looked completely relaxed and ‘part of the furniture’ onstage during the band’s recent live performances. “When Paul left the band at the start of 2013 it was a huge blow to all of us, as he’d been part of the band from the beginning,” Edwards explains. “We knew that we didn’t want to stop making music, but decided to continue as a four-piece. We were fortunate to know Pete Harwood of Morpheus Rising who agreed to complete our tour dates for the year, learning most of our back catalogue in a couple of weeks. Pete’s really busy pushing Morpheus Rising forward, so when we came to work on the new album we initially thought about getting various guest guitarists to play on different songs. But I think we felt that may have resulted in a more fragmented sounding album, so we decided to just find one player to work with – and besides, there’s something good about immersing yourself in a whole project with one person and involving them in it. We knew of Adam as a really good local musician and Gavin and Yatim had both played with him previously. We liked his musical style and invited him to come and play on the album and the accompanying tour and that’s working out really well. Aside from the individual songs, one of the most noticeable things about the album is the way it not only hangs together, but in fact flows – the ten tracks all have their individuality, certainly, but taken together add up to so much more. (This strength is probably best demonstrated by the fact that at the band’s gig at the Komedia in Bath in June all but one of the album’s cuts – ‘Searching’ being the odd one out – made the live set.) Edwards agrees. “Although they’re individual songs, it’s also important that the album as a whole has a flow to it and feels satisfying as a listening experience. So it’s about writing and then selecting a group of songs that fit together. We always try to make albums that are interesting for ourselves and hopefully, by extension, for the listener as well. It’s satisfying to work on a song and develop it from a basic structure into a living breathing thing that develops as it plays out. So we do try to make music that bears repeated listening and has layers that may not be apparent at first, but emerge the more you listen. With any song there’s the basic chord structure and melodies, but it’s important too that elements in the music support the lyrics and the meaning of the songs. So nothing in the music is there unless it serves a purpose musically. Although this may sound like an intellectual process (and it is, to a degree) it’s largely an intuitive thing. It’s about listening as you’re creating and ‘feeling’ what’s right. And any work that’s gone into crafting the song should be invisible to the listener. The most important thing for us is that the music has an emotional dimension; it has to make us and our audience feel something. “And, as I said, I do think our music stands up to repeated listening,” he continues, “and in fact requires it if you’re going to get everything out of it. Finding something new in a song I may have heard many times before is something that I get a lot of pleasure from in the music that I listen to. Generally speaking, music where everything is revealed on the surface doesn’t tend to retain my interest; there’s a lot to be said for hidden charms!” he laughs.